The 4-day-old Waxing Crescent Moon should show distinct earthshine on the dark part of its disk. Saturn, now some 1.5 billion km (950 million miles) from Earth is dimming rapidly. Venus, now 100 million km (67 million miles) from Earth is approaching maximum brightness. Spica, a blue dwarf star at a distance of 262 light years, is still the 15th brightest star in our sky. 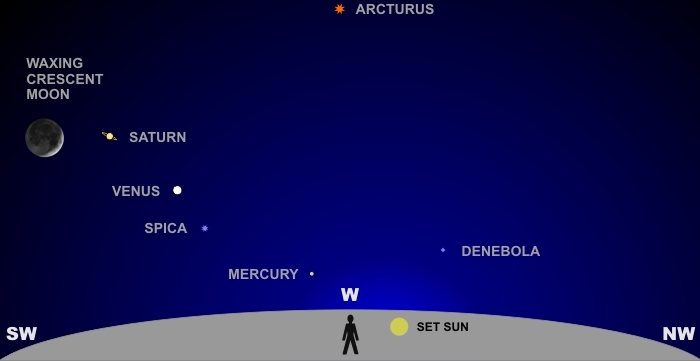 Mercury, at a distance of 53 million km (33 million miles), and being the smallest of the planets, is very faint. Binoculars on a steady tripod will help when observing this conjunction. Lunar earthshine will be more visible, you should be able to make out Saturn’s straw-like color and rings, Venus will show a gibbous phase (appearing slightly off-round), Spica’s blue color will be more apparent, and your chances of spotting Mercury greatly improve. Since all these objects are relatively low in the sky, they’ll set as the Sun did, sequentially disappearing from view in a matter of 2-3 hours. So there’s a “sweet spot” for catching these objects that starts 15 minutes after sunset. As the light of dusk fades, the fainter objects will be more easily seen. Good luck bagging these temporary quintuplets.